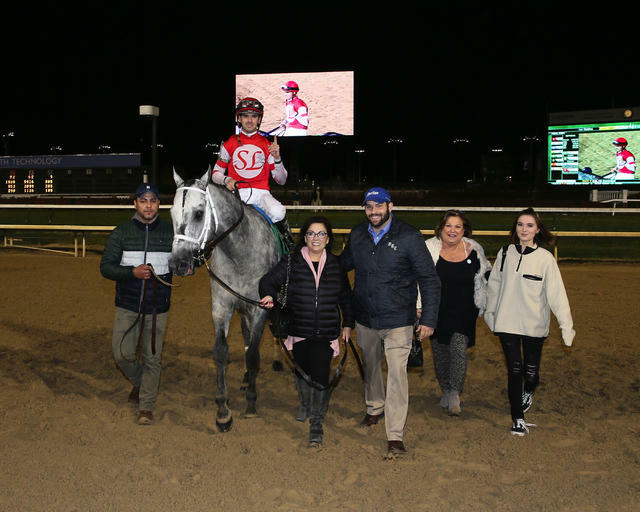 With Leofric’s indomitable victory in Friday’s $500,000 Clark Handicap Presented by Norton Healthcare (Grade I), trainer Brad Cox is looking ahead to 2019 for a 6-year-old campaign that includes several options, including the $9 million Pegasus World Cup Invitational (GI) at Gulfstream Park on Jan. 26. The lofty $300,700 first prize in the Clark lifted the gray or roan Kentucky-bred’s earnings to near-millionaire status: $951,040 from a record of 8-1-3 in 14 starts. The win also vaulted Cox above $14 million in purse earnings for 2018 – nearly $6 million more than his career-best in 2017. Owned by Steve Landers Racing, this was the first Grade I win and third graded stakes victory of the year for Leofric. In addition to winning the Fayette, he scored in the $200,000 West Virginia Governor’s Stakes (GIII) at Mountaineer in August. After the latter, Leofric finished third behind Yoshida (JPN) and Gunnevera in the $750,000 Woodward (GI) at Saratoga. With five weeks to go in 2018, Cox is ranked fourth nationally with 223 wins through 840 starters and fifth in purse earnings with $14,315,854. Cox recently celebrated his 1,000th career win when Play On won a maiden special weight at Fair Grounds on Sunday. The 38-year-old conditioner is third in the Fall Meet standings at Churchill Downs with seven wins. FALL MEET LEADERS COMING DOWN TO THE WIRE – When Saturday’s 12-race card began, there was a three-way scramble atop the rider standings between Tyler Gaffalione, Corey Lanerie, and Edgar Morales with 18 wins while Brian Hernandez Jr. tracked in fourth with 17 wins. Gaffalione, a 24-year-old Florida native, won four races on Friday’s program to vault back into contention for leading rider honors. The 2015 Champion Apprentice Jockey arrived for his first full-time stay in Kentucky during Keeneland’s Fall Meet and continued onto Churchill Downs. Lanerie, a 44-year-old Louisiana-native, has won 16 of the last 19 meets at Churchill Downs including the last six Fall Meets. Meanwhile, Morales, a 20-year-old from Puerto Rico, recorded 16 of his 18 wins when he still had a five-pound weight allowance for apprentice riders. Since Morales graduated from the apprenticeship ranks last Saturday, he’s had only one victory through 21 starts. Hernandez scored a double on Friday’s card to put him back in contention for leading rider honors. The 33-year-old won his first Churchill Downs riding title at this year’s Spring Meet. In the trainer standings, Dallas Stewart is hoping to score his first leading trainer honors at Churchill Downs with a 11-9 win lead over Hall of Famer Steve Asmussen. Stewart had eight entries on Saturday and Sunday while Asmussen had 15. Ron Paolucci’s Loooch Racing Stables moved ahead of G M B Racing 5-4 in the trainer standings with a victory by Karma Delight in Race 3 Friday. Calumet Farms, G. Watts Humphrey Jr. and Juddmonte Farms are tied for third with three wins each. BIG SINGLE 6 AND LATE PICK 5 CARRYOVERS TO TACKLE SATURDAY – Racing resumes Saturday at Churchill Downs with a 12-race program that begins at 1 p.m. (all times Eastern). The 92nd running of the $200,000 Kentucky Jockey Club (GII) – a “Prep Season” race on the Road to the Kentucky Derby – and the 75th running of the $200,000 Golden Rod (GII) for fillies are the headliners on the second-to-last day of Churchill Downs’ 21-date Fall Meet. Billed as “Stars of Tomorrow II,” each of the 12 races is exclusively for 2-year-olds that may have aspirations of trail-blazing their way to next spring’s Kentucky Derby Presented by Woodford Reserve and Longines Kentucky Oaks. There is a massive $317,738 carryover in the 20-cent Single 6 Jackpot to chase on Races 7-12 after Kentucky Horse Racing Commission stewards made a double disqualification in Friday’s finale. If the result stood with Presidential Tweet crossing the wire first, the full jackpot would have been paid. Instead, both President Tweet and runner-up New Colossus were disqualified for interference in deep stretch and third-place finisher Laser Loop was promoted to first, which triggered the massive full carryover. BREEDERS’ CUP JUVENILE CHAMP GAME WINNER CONTINUES AS 6-1 INDIVIDUAL FAVORITE IN FIRST DERBY FUTURE WAGER; POPULAR ‘ALL OTHERS’ OVERALL 6-5 FAVORITE – Through the first two days of wagering on Pool 1 of the Kentucky Derby Future Wager, the popular “All Other 3-Year-Olds” option continued as the heavy 6-5 favorite over second choice Game Winner at 6-1. Other horses taking early action include impressive maiden special weight winner No. 3 Coliseum (9-1), Best Pal winner No. 9 Instagrand (10-1) and Street Sense Stakes winner No. 8 Improbable (16-1). “All Other Sires” continued to hold favoritism on Friday at 4-1 over offspring sired by Candy Ride (ARG) at odds of 5-1. FILLY MAKE HAPPY WINS FIRST RACE IN ‘JAPAN ROAD TO THE KENTUCKY DERBY’ – California-bred filly Make Happy remained perfect from two starts when bossing the boys in Saturday’s Cattleya Sho at Tokyo, the first scoring race on the Japan Road to the Kentucky Derby. Sent off as the heavy 2-5 favorite, the Kazuko Yoshida colorbearer prevailed by 2 ½ lengths from Godolphin’s Kingen. Make Happy was bred by Reddam Racing, best known for campaigning Kentucky Derby (GI) heroes I’ll Have Another (2012) and Nyquist (2016). J. Paul Reddam also owned Make Happy’s sire, Square Eddie, who was on the 2009 Derby trail before injury intervened. Sold for $650,000 as a 2-year-old in training at Fasig-Tipton’s Gulfstream Sale in March, Make Happy romped by 10 lengths in her Oct. 7 debut at Tokyo. That made the Koichi Shinkai trainee the odds-on choice in the Cattleya Sho, held over the same track and metric mile trip. Make Happy broke beautifully from the far outside post 14, and regular rider Christophe Lemaire eased her a few lengths back as Kentucky-bred Evacuant set the pace. The stalking Johann was the first to pounce in the stretch, but Make Happy emphatically asserted her authority. By finishing the metric mile in 1:38.3, Make Happy earned 10 points on the Japan Road leaderboard. Kingen rallied from farther back in the pack, taking home 4 points as the runner-up. Johann scored 2 points in third, and Romantico got on the board with 1 point for fourth. Kentucky-bred Washington Tesoro underperformed in 10th, and early leader Evacuant faded to 12th of 14. Make Happy is a full sister to a pair of notable Reddam runners, 2015 Hopeful (GI) winner Ralis and multiple stakes scorer and Grade III-placed B Squared, most recently sixth in the Nov. 3 Breeders’ Cup Sprint (GI) at Churchill Downs. Their dam, Silar Rules, is herself the daughter of Ten Most Wanted and Grade III victress Morning Meadow. MEMORIAL SERVICE FOR ODANIS ACUNA SET FOR SUNDAY – There will be a visitation and memorial service on Sunday from 3-6 p.m. in the Churchill Downs Chapel for exercise rider Odanis Acuna, who was tragically killed two weeks ago during a morning training accident. Guests are to enter the Stable Gate off of 4th St. and proceed to the Chapel.